Few things are as thrilling in an otherwise exciting life, as to walk into my bathroom and see a short roll on the wall. This presents an opportunity to reload with the pull coming from under, rather than over. I usually exhaust the short roll, whether or not it’s ready, simply to enjoy a victory in the domestic competition of Roll Reversal. Now, it is most likely understood that to install the roll with the pull on the top is a thriftier method than pulling it from below. I am sure there is some statistical evidence to prove it. When pulling a strand from above, it tends to break off too soon. From below, I get as many sheets as desired without being hindered by gravity. A thick barrier is my preference, so the monetary waste is not a concern. Trying to save on paper is outweighed by the need not to be hygienically-challenged. With regard to paper towels, there seems to be the same thinking. She likes ove r, I like under; causing me to spend more time waiting for the slight turn of her head, giving me the chance to redirect the next roll. It may seem insignificant to you, but to me it is important. The pull of the roll makes all the difference. I must win. But, the battle never ends. There is no winner. This conflict probably takes place within numerous households all over the world. Differences in toothpaste tube-squeezing are not as pronounced as the installation of the roll. I like to sque eze the tube from below, forcing the paste toward the top, and she likes to squeeze it from the top, forming the tube into some gnarling, twisted plastic gob, leaking stuff from all sides. That waste offsets my paper abuse. Even so, she’s still winning. The amount of paper used during the lifetime of a tube of toothpaste, is far more significant. I am causing more of a financial burden than she. 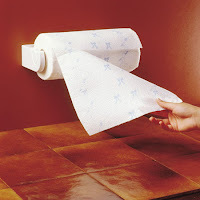 When visiting family or friends, I never take it upon myself to change the direction of their rolls; usually refraining from using their facilities, unless there is no alternative. If the unwelcome opportunity presents itself and a roll is encountered going in an anti-direction, I just let it go. Changing it is not my place. It’s not my home. They can continue the economic pull as long as they want. Spend the savings on a softer seat. Public restrooms are the pits. The worst are those that offer a few sheets here and there, in those little, silver dispensers that make you pull out a square at a time. The management of whatever stall you are using, really doesn’t care about your comfort as much as they care about paper savings. Avoid them, especially the ritzy office buildings in cities. Those building owners have their own bathrooms, and really don’t understand the burden. It’s best to just buy a large cork and avoid public restrooms altogether. If you are like me and feel the need to redirect a particular roll at any particular time, try to be discreet. The person causing your irritation may be serious about the pull of their roll. Being caught changing it could prove embarrassing and lead to difficulties in a relationship. Make sure you whistle or otherwise make a great deal of noise during the switch. They may suspect your intentions and be listening for the click of the dispenser. Sorry, I have to stop now. I think she hears my typing, and may know the transfer is being made. I don’t need to bicker about the over or under. « What’s That In Your Pocket? OMG. You are hysterical. I’m an “over” person and my twin sister is an “under” person. When we lived together we constantly changed the direction of the toilet paper roll on eachother. I never realized how ridiculous and important this issue is until reading your blog. Thanks for the smile!! !